Every year I try to take my son and daughter on a trip somewhere fun. We live in three different cities and work in three different industries, so it’s a time to catch up. Last year, I took individual trips, but this year I booked a weekend with me and Sally and Thomas (Jan was in Savannah with 20 classmates celebrating their, ahem, recent noteworthybirthdays). My history of trips with my kids is slightly legendary. We used to have one major mishap each trip, a mishap that we go over with fond memories on successive trips – including this one. There was the time we flew out West for two weeks of camping (and some motels) from the Grand Canyon to Yellowstone … the first night we arrived at Coral Pink Sand Dunes in Utah, unloaded all the tent and camping equipment – only to learn I left the tent poles back in Atlanta. We scrounged around a dump and found some scrap metal for the first night or two, later buying poles at a camping store. There was the time we drove a rental car to the top of Mount Tamalpais (Mt. Tam) outside San Francisco and drove all the way to the top, only to realize we were very low on gas … we coasted in neutral all the way back down the hill to a gas station. Or the time we were in France and I misunderstood the instructions of the rental car guy who didn’t speak English and I later filled the tank with the wrong kind of gas … forcing us to sputter to a stop at the side of the highway at night, but just a few feet from a tow truck who was just finishing service on another car. He towed us back to his house and drained our tank and refilled the fuel lines with the proper fuel. We drove off happily late in the night back to the chateau in Vendome. So this time, I gave the kids a choice … big city, small town, out West, New York, Miami? Or maybe a cruise. They voted cruise. I checked the dates and found the one line that worked for our calendar was a Disney cruise heading to Nassau and Disney’s private island. I read the online comments and even adult kids had great times on Disney cruises. So, why risk my record? I decided to leave it all to Disney. So Sally flew from Charlotte, I flew from Atlanta and Thomas flew from Raleigh. We all landed in Orlando at the same time, grabbed a rental car and drove to Port Canaveral, where we hopped on board with unusual ease. 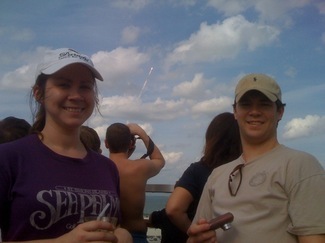 We were greeted on deck with an adult beverage and the countdown for the Shuttle blastoff – just a mile away. We had a great view from the deck of the Wonder. It brought back memories from 1992, when we went to Disney World and realized there was a Shuttle blast on Monday. We stayed an extra day to see that. And this was another beautiful bonus to yet another great trip. Disney did a great job … food was great, the cabins were very nice, shows were well done and we all especially loved Castaway Cay, their private island. Sally and Thomas got enough sun to show some burn when they headed back to the office on Monday. This time, it was a perfect trip and we all left with fond memories to talk about in future years. Photo: Sally and Thomas on the deck on the Disney Wonder with the Shuttle blasting off between them on February 7, 2008. This entry was posted on Thursday, February 14th, 2008 at 2:15 pm and is filed under Family, Fatherhood. You can follow any responses to this entry through the RSS 2.0 feed. You can leave a response, or trackback from your own site.